On the road to Nendrum you pass Ringneill Quay. Car parking is limited to a small area just before the Quay and on a bend. Sounds bad but isn’t, there is room for 2 cars. The coordinates are for the cache, which is a micro, so only room for the log and a FTF pin badge. Ringneill Quay is one of many around Strangford Lough built during the first half of the 19th Century, usually for off loading coal. 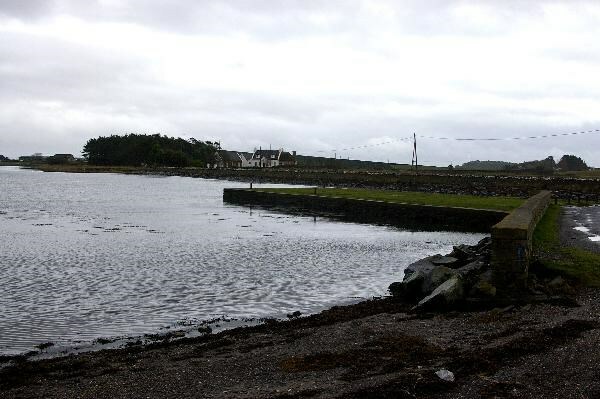 The quay is at the start of the causeways that connect a series of islands together terminating at Mahee Island where Nendrum is sited. For many years the remains of a 3 masted schooner, the Fanny Crossfield, of 119 tons, built in Carrickfergus, lay just off the quay. She grounded on the Lough in 1930 and was gradually dismantled after WW2 until the skeleton eventually broke up in the 1980s. You can still find bits of the odd timber and pins along the shore just north of the quay. It is also a good vantage point to view the Brent Geese, wading birds and swans, especially in October and the winter months. The cache is a 35 film container with a log book, pencil and a FTF pin badge.